Not far into the third chapter of No Surrender, the massive Avengers story written by Mark Waid, Al Ewing, and Jim Zub with art by Pepe Larraz and David Curiel, Rogue is picking the line-up for the team she will take with her to search for the villainous Black Order. 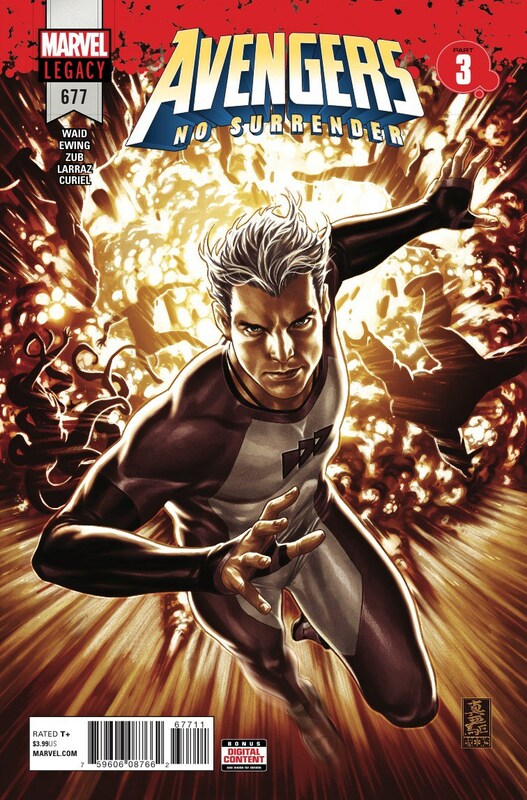 Quicksilver, the issue’s viewpoint character, assumes he will be picked, since he wasn’t chosen for the other team. When she doesn’t and he protests, she tells him that she needs people she “can count on out there. That ain’t you.” For those who hadn’t read the final issues of Uncanny Avengers, this may be a bit confusing. Not because anyone would be shocked that she shouldn’t trust Quicksilver, but because, even without knowledge of the events of those issues, no regular reader of Avengers would expect anyone to trust him. Which makes his choice as viewpoint character all the more confusing. 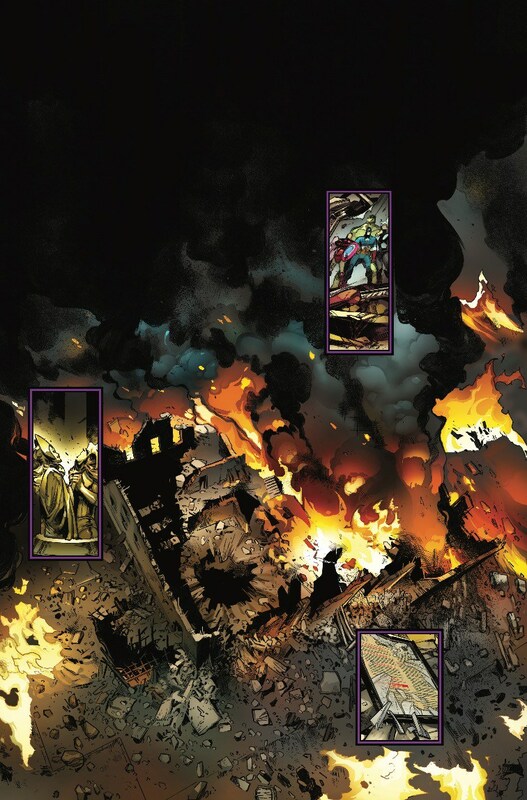 Rather than build off the momentum from last issue, the writers’ employ what amounts to a giant reset button, skirting any conflict with the Black Order and immediately diminishing the impact of the previous issue’s cliffhanger. The rest barely advances any of the story’s plot elements. The Jarvis subplot is given one tiny detail that doesn’t really make it matter more than it did previously; the Voyager subplot gets put aside; one of the mysterious voices are revealed (and it’s pretty much what everyone expected), while the other is still shrouded in mystery; and the frozen Avenger subplot gets a minor advance. This leads to what is intended to be a shocking ending, but it’s undermined by the fact that the character impacted most by its events is one of the least liked Avengers, the aforementioned untrustworthy Quicksilver, who has betrayed just about every single group on Earth at some point over his career. If he turns out to be the Avenger teased to die next issue, it will be a wasted death, since the character is hardly beloved by anyone. Even his sister sees what a mess he is. Even Lightning, who was the viewpoint character for Chapter 1 and really helped give the event the scale it needed from go, only gets a tiny, single panel beat in the issue. And most readers wouldn’t have known it was him if Quicksilver hadn’t directly named him. This shows how enormous and unwieldy this story really is. It’s not outside the realm of execution, and could, if handled right, be a great Avengers story, but this issue exposed some of these pitfalls for the first time, and, in a big story that needs to maintain its momentum to hold on to its weekly audience, this could be damaging to that. This issue is frustrating, because it has elements that should make it a great read, but it just doesn’t land, the threat seems deflated and diminished and the emotional stakes don’t resonate like the writers want. Artist Pepe Larraz continues to produce great work, but he’s given much less plot this issue to really show off his abilities. That’s not to say he doesn’t deliver; his version of the Grandmaster may be the most menacing one ever put to paper. Aided by masterful color work by David Curiel, it’s not hard to see why he’s been included in the newest phase of Marvel’s Young Guns initiative. It would have been a travesty if he wasn’t. But much of the action is too disjointed, with little continuance between panels, so it’s hard to get engaged by it. Even the one good action beat gets no follow up, assumedly left for next issue. Again, frustrating. Maybe it will read better in trade. While not being weak enough to derail the entire event, Avengers #677 doesn’t really do much for the story, and it’s hard not to feel that much of that is caused by the choice of featuring Quicksilver, whose massive baggage weighs down any intended emotional resonance. Hopefully next issue won’t suffer from the same problems.